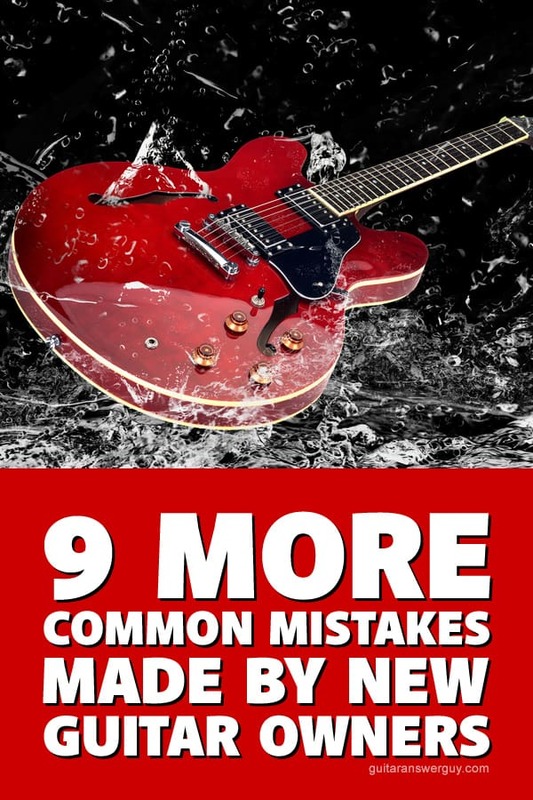 Awhile back, I wrote an article titled 11 Common Mistakes Made by New Guitar Owners. Wouldn’t ya know it, as soon as I published that article a bunch of other “common mistakes” started coming to me–things I’d completely forgotten about. So, let’s dive in! 1. When changing strings, taking all the new strings out of their packages at once. You might have the urge to take all those shiny new strings out of their individual packages at once. Resist this urge. Once out of the package, it can be really hard to tell some of the strings apart and you might put some of them in the wrong place. Only remove each string from its package one at a time, when you’re ready to actually install it. An exception would be D’Addario strings. The ball-end of each D’Addario string is a unique color, and the package tells you the string size for each color. So, as long as you don’t destroy the package (and aren’t color blind), you’re good to go. Regular D’Addario users eventually memorize which color denotes which string. Don’t remove all the guitar strings from their packages at once. It can be tough to tell those suckers apart. Speaking of strings, did you know that when you put new strings on your guitar they have to be physically stretched (by hand)? I’m not talking about simply playing them. I’m saying that once you put a new string on, you have to tune it to pitch, stretch it a bit, tune it again, stretch it again, and continue doing so until it stabilizes (stops going flat). This also helps seat them firmly against the tuning pegs, nut, and saddle(s). 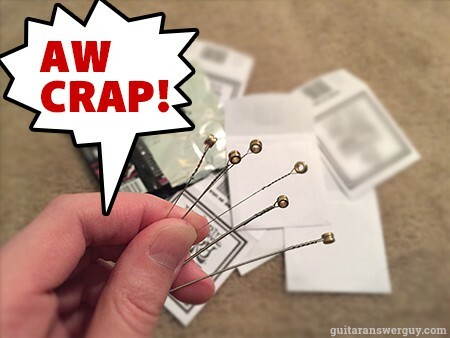 If you’re not sure how it’s done, check out my blog post on how to stretch guitar strings. You need to stretch those new guitar strings! Here I’m using one of my favorite gadgets for the job: The String Stretcha™. 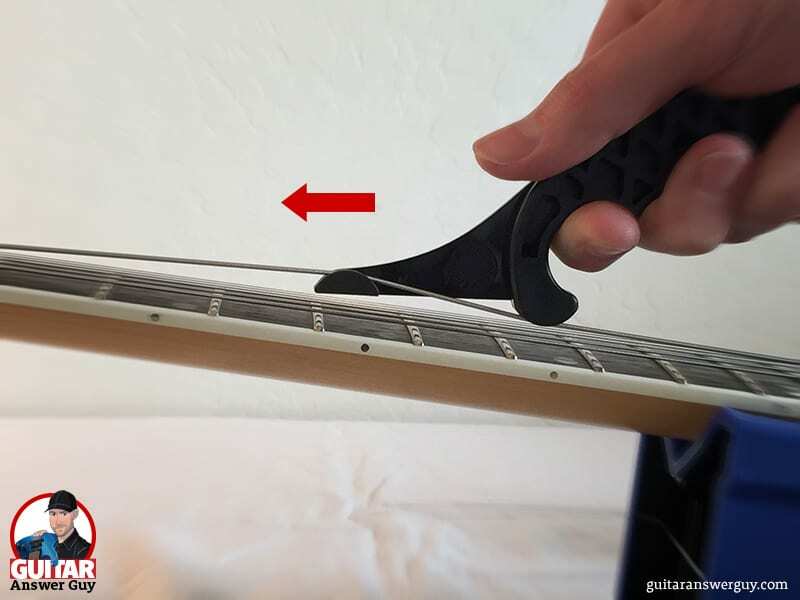 If you don’t stretch them, you’re guitar will continually go flat immediately after you tune it, and it’ll continue to do so for hours, especially when you bend a string. It can be maddening if you don’t understand what’s going on and why. You can stretch your guitar strings by hand or, if you have to stretch a lot of strings on a daily basis like me, you can use a tool like the “String Stretcha” pictured here. When you’re new to playing guitar, it can be difficult to discern whether the pitch is going up or down as you’re turning the tuning pegs. If you’re unsure, and just keep twisting the string tighter and tighter, there’s a point where the thinner, unwound strings will simply snap. This can be pretty jarring (okay, it can scare the #[email protected]! out of you). Then the realization sets in that you don’t have a spare set of strings. If you’re unsure, take your time to first figure out whether the pitch is going up or down. Try to match your voice to the pitch and sing along with it as you turn the tuning peg, noting whether you’re having to raise or lower your voice. It can be tricky at first, but as you gain experience you’ll be able to instantly recognize whether the string is being tightened or loosened. This one is rare, but I’ve seen it with my own eyes: Someone grabs the guitar case by the handle and lifts it without first making sure the latches are secure. The top pops open and the guitar tumbles out and crashes to the ground. The guitar will usually survive such a fall, but that new, shiny finish will not. This one will definitely leave a mark (or three). It’s “road rash” in the truest sense. So, try to get in the habit of quickly checking your case latches before you grab your guitar case and run. My girlfriend has a permanent scar under her right eye because, many years ago, a guitarist (not me) turned suddenly and whacked her with the headstock. It slashed her cheek open just under her eye and required 15 stitches. I’ve seen many guitars and people damaged because a guitarist decided to turn without first looking–whacking the headstock into someone or something. When you’re wearing your guitar, get in the habit of lifting the neck up before you turn in either direction. Even if you think you can see clearly that there’s nothing around you, make it an automatic habit to lift the neck. You don’t need to stick the guitar way up in the air, just grab the neck and pull it toward your head–as if you’re inspecting the tuning pegs. A note of caution: If you wear your guitar really high, watch out for ceiling fans before doing this maneuver indoors. I’ve seen several guitars accidentally jammed into low ceiling fans. As a beginner, you may not be able to tell whether the guitar is slightly out of tune or not using just your ear, so make it a habit to check the tuning (and correct it, if necessary) before you begin playing or practicing. 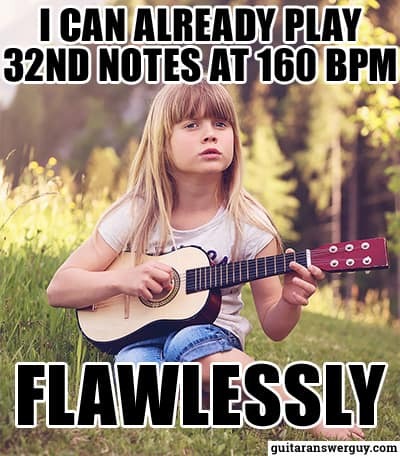 Resist the temptation to just start playing without tuning. It should only be slightly out of tune (if at all), so this really shouldn’t take too long to correct. As you’ve played guitar for a few years, you’re ear (more accurately, your brain) will begin to memorize pitches. It’s a form of ear training that naturally happens over time. Playing an in-tune guitar will ensure you’re memorizing the correct pitches. Some day, you may even get to the point where you can tune your guitar by ear (without an electronic tuner). Buy a little clip-on tuner for your guitar’s headstock (or soundhole) and just leave it there, so it’s always ready. I use two tuners from D’Addario: the NS Micro Headstock Tuner for my electric guitars and the NS Micro Soundhole Tuner for my acoustic guitar. YouTube is filled with child prodigies. It used to really get me down, but nowadays I could honestly care less. For whatever reason, 11 years later I picked up the guitar again and I haven’t put it down since. Now, I simply love playing guitar for the sheer joy it brings me. I have no desire to be better than anyone, nor do I compare my progress to others. I no longer become discouraged when I see guitarists (even children) who are better than me. I could truly care less. It’s very liberating–like a huge weight has been lifted. We’re all busy with the million other distractions and obligations that life throws at us. These can make it hard to practice guitar consistently. However, to the greatest extent possible, try to practice guitar a little every day. Or, at the very least, try not to go more than 2 days in a row without practicing. Of course, this is assuming that you’re serious and wanting to make solid progress on the guitar. I often tell people that it’s better to practice for only 10 – 30 minutes every day (or as many days as possible) rather than doing big 2+ hour practice sessions only a few days a week. That’s what I call “feast or famine” practice: when you’re practice sessions are very long, but you only practice 2-3 days per week. Ahh, this one is the guitarist’s equivalent to “analysis paralysis.” There’s so much juicy gear out there–cables, strings, pickups, pedals, amps, and on and on. While there’s nothing wrong with having some fun and trying out gear, reading gear reviews, etc. try to avoid the trap of getting so wrapped up in finding the perfect piece of gear that you forget to actually PLAY GUITAR. You also have to make sure you’re not just subconsciously procrastinating. There’s this weird phenomenon that I have yet to explain: I absolutely LOVE playing guitar, yet I sometimes find myself doing everything BUT actually playing guitar, even though I have free time. Looking at gear is the #1 thing I do on such days, and I sometimes have to snap myself out of it, put down the guitar catalog (or Internet), and just play my dang guitar. As a new guitar owner, what are you struggling with the most right now? Let me know in the “Leave a Reply” section down below. Maybe I can help. Think I made a rookie mistake of not shortening my (classical) strings when I put them on and so I wound up with way too much string on the tuning post. Without realizing it, I think the string jammed while I was tuning and so brand new string snapped. It’s like someone peeled open my skull and took a look inside! I am guilty of points 7, 8 and 9 on an Olympic scale. I nearly ditched the guitar for good earlier this year. I have to take medication which affects my concentration and that, along with terrible practice habits (going months without practicing at all) and work commitments has meant that after seven years, I am capable of open chords and a few simple songs and not much else. My son wanted a guitar for his birthday, so we bought him one and within six months, he’d surpassed me. That was incredibly deflating for me and I nearly sold the whole lot out of frustration. I’m glad I held off because I still enjoy it, but it’s good to know I’m not the only one who gets demotivated by child prodigies. Now, I congratulate him on his progress and ask him to teach me things! 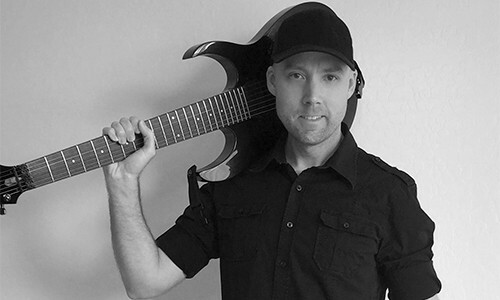 I think it really comes down to your reason(s) for playing, and your goals as a guitarist. 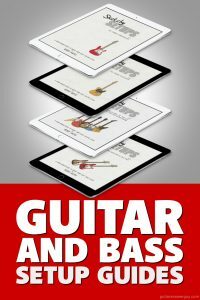 If you’re trying to become a professional, performing musician who earns their living from music, then you certainly DO need to be more concerned about how you compare to other guitarists–especially if you’re a studio/session guitarist. You’re quite literally competing against other guitarists for gigs. No different than other careers. On the other hand, if you play guitar simply for fun, relaxation, etc. then there’s really no reason to get discouraged by other people’s progress. It’s not a competition, and the only person you should try to surpass is yourself. After learning chords on my Montgomery Ward $30 acoustic guitar, I was ready for a brand new guitar. Went to my local music store but to shy and intimidated to actually play the guitar that I was looking to purchase. Consequently, I bought the guitar that was in my price range and what the sales guy recommended. Yep, paid full blast retail for a Japanese acoustic. Hindsight, at least take a knowledgeable guitar player with you. Another similar thing (I did when starting to play) is to buy a guitar based on its looks rather than sound & playability. Chris, that’s very much along the same lines as using gear-shopping as a way to procrastinate. 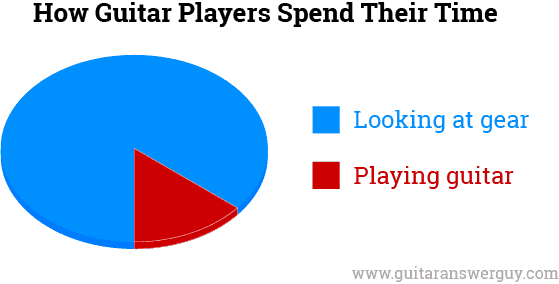 Sometimes, we guitarists just plain procrastinate when it comes to playing/practicing. We find every excuse in the world to keep us busy on things OTHER than playing guitar. We tell ourselves that we’ll play guitar in a minute… after we throw the laundry in the dryer. Or, we’ll just watch this one TV show and THEN practice. Blah blah blah… and before we know it, another day has gone without picking up our guitar. 6 Ways Guitarists Can Reduce Hand and Finger Pain Community Discussion: What One Piece of Music Gear Would You Love to Have?